The BlackBerry Q5 has no hardware call buttons, so the quickest way to call someone is to start typing their name or phone number on the keyboard and tap on the contact when the Search feature finds it. To get to the dialer, tap the Phone shortcut in the bottom left corner (it's visible on all homescreen panes but the Hub). The dialer has three tabs - Calls, Contacts and Dial pad. We were a little disappointed to find out that you can't swipe between those three (after all, you can swipe between almost anything else). The Dialer has been pushed to third place because it's not very useful - you have a powerful hardware QWERTY keyboard and your contacts are just a few quick clicks away. Furthermore the virtual dialer has no smart dial, you have to enter the number manually. There is a feature called "Smart dialing" but it's not the usual "search as you type" thing. Instead, it only automatically applies country and area codes to the numbers you dial (which is useful in roaming). A nice option for those still using cellphone holsters is the option to automatically answer and hang up when taking the Q5 out of the holster and putting it back in again. Leave it to BlackBerry owners to still use holsters. Anyway, you're better off using the Contacts tab. It's a list of contacts sorted alphabetically. There's a search field - you don't need to look for it, just start typing with your hardware keyboard and the Search will do its job. A tap on a contact expands into a list of all assigned phone numbers. The Call log features three shortcuts on top - Voice Mail plus three contact numbers. You can add more quick-dial numbers here, but the more you add, the further down the actual call log gets pushed. The call log itself displays either all calls or just missed calls (there's a toggle). Calls are grouped together to save space, e.g. two outgoing calls to the same contact are displayed as one item with a call counter. The Phonebook looks a lot like the Contacts tab of the phone app, it also has a search field and it is also automatically activated when you start typing with the keyboard. Tapping on a contact here brings you to the contact info, which is split into three tabs. The first tab is details - this is where all the phone numbers, email accounts, URLs, birthday and other info (including Facebook friends and Twitter followers count) are listed. If the same contact uses multiple services, you can link the entries and have everything in the same place. Yet another trick from Hub is the long press - this gives you an easy access to several options straight in the contact lists. It's especially quick if you do it as one gesture (press and hold on a contact then move your finger to the option and release). 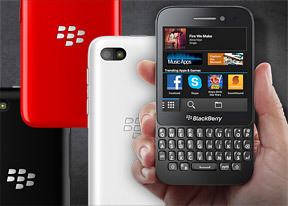 The BlackBerry Q5 has a louder ringer than the Q10, which combined with vibration you shouldn't be missing any calls. You can read about how the loudspeaker test is done here. The File Manager is there for more advanced file browsing needs. It shows the internal and external storage as either a grid or list of files and folders. You can sort them by name, date, type and size in either ascending or descending order and if you still can't find what you need, there's the search feature. BlackBerry OS 10 imposes a strict structure at the root level of the internal storage - folders are predefined and you can't change them. Inside those folders and on the external storage (microSD card), you're free to organize folders as you like. Files and folders can be moved, copied and deleted in bulk, renamed or even zipped up into a single file and then unzipped (sending multiple files is easier if they are in a single file). To switch between the internal and external storage, you do the same swipe right gesture used to filter items in the Hub and Contacts apps. The app is cloud-enabled too, you can add Box and Dropbox accounts. They are treated almost the same way as a microSD card, so copying files between phone and cloud storage is seamless. There's no search option here (but you can still sort folders). Adding those cloud accounts happens through external apps (Box and Connect to Dropbox), which is a bit clunky. These apps show the time of the last sync, your storage usage and have a toggle to disable syncing over mobile data (great if you don't have a solid data plan). The Box app also has toggles to automatically upload photos and videos to the cloud. One potential problem with this app is that it only supports one account from each service. To be fair, so do the official desktop clients for these services. Still, it's worth noting if you're one of the few people who keep multiple accounts. When you switch away from the Manager, its active frame changes to show memory usage on the various storage locations, giving you handy at-a-glance info.